The late 1970s saw the emergence of the Anti-Nazi League (ANL) in response to the growth of the National Front (NF). The NF targeted left-wing, Irish and Troops Out public meetings in the town centre. In response to the threats and attacks on left and progressive meetings. a stewards group was formed by anti-fascist activists from a number of left groups in Manchester. The primary function was defensive, and with the influx of activists politicised by the ANL, this type of frontline defensive grouping attracted the interest of many keen to implement Sir Matt Busby's football strategy "Attack is the best means of defence," in the political arena against the fascists. This was evident when the Manchester NF football team "The Lilly Whites" attempted to fulfil their league fixtures, only to be kicked out of the park by some tough tackling anti-fascists. Left/Irish meetings were resolutely defended and fascists activities were attacked/disrupted without let up. The high point of the ANL campaign was the Manchester Carnival. After the 1979 election demise of the NF, the ANL organisationally ground to a halt. However, fascist activity didn't, and the beginning of the eighties saw the NF attempt to sustain a paper sale in the centre of Manchester. This was met with attack after attack and on one occasion the whole NF group were ambushed at their meeting point. A number of NF supporters were taken to hospital including a German soldier on leave from NATO duties. Both covert and overt operations designed to disable the NF organisationally and demoralise their membership were carried out. The net result was that the NF were driven out of the town centre and no fascist group has managed to regain the position since. 1981 saw the re-emergence of the ANL in response to the continued NF and British Movement (BM) threat, both now operating on an openly Nazi ticket. It also saw the Hunger Strike Commemorations for Irish Republican POW's held during the year. This led to the resurrection of the Manchester Martyrs Commemoration. The issue of Irish Nationalism has always proved a great motivating factor for British Nationalists in Manchester, especially after the successes in 1974 of driving the Manchester Martyrs March (MMM) off the streets amid much anti-Irish hysteria in the aftermath of the Birmingham bombings. The MMM of 1981 and subsequent years ensured a large fascist turnout, and likewise an even more determined anti-fascist presence, who showed both the capacity and tenacity to extend the skirmishes to before, during and after the march. This has been fine-tuned over the years to the extent that even in 1993 despite the MMM being a shadow of its former self, the fascists still implement an "arrive late and leave early policy". No doubt there are some who will be leaving even earlier this year! The ANL which re-emerged in 1981 contained many of the anti-fascist street activists of the late '70s who had now embraced the need to organise politically as well as being active on the streets. This led to a more direct style of political campaigning with anti-fascist groups operating week in week out at Maine Road (Manchester City's Football Ground), and Old Trafford (United's, need I explain!). Pat Crerand, ex-Celtic and Man United player came out on occasions to assist the Reds Against the Nazis (RAN) group issuing leaflets. At Maine Road, the situation was somewhat more serious as MCFC had an in-house Nazi NF following, who had on occasions attempted to leaflet the ground. The arrival of Blues Against the Nazis (BAN) incurred the wrath of City's Nazis and the anti-fascists came under attack. Word of the attack spread and at the next home game, the NF attacked again but this time they were counter attacked by the `Kool Kats' (MCFC Black Youth). 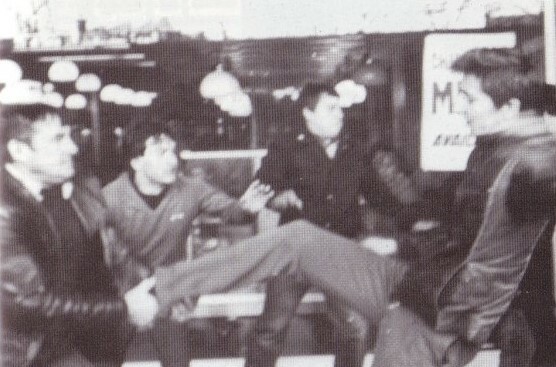 One key NF member was chased into City's souvenir shop and severely beaten by some of City's anti-fascist supporters. With the escalation of violence by the NF at Maine Road, BAN wrote to P. Swales (City's chairman) asking him to condemn the City NF following. He refused on the basis that one lot were as bad as the other! This proved the widely held theory that he knew as much about politics as he did about football. On a regional level, ANL activists from Manchester involved themselves in the campaign against NF chairman Andrew Brons, who was working as a lecturer at Harrogate Further Education College. Indeed Manchester anti-fascists along with Asian youth from Bradford, operated with distinction against the fascists (bussed in from Leeds) on a number of occasions. Civic recognition was bestowed on some anti-fascists, who received custodial sentences from Harrogate magistrates for turning over the BM. On another occasion, Steve Gaunt, Brons' minder, found himself on the receiving end from anti-fascists after being arrested and handcuffed to the arm of a solitary police officer. The officer was unable to make any further arrests or take contemporaneous notes! Recently Searchlight informed its readers that Steve Gaunt had returned from Croatia minus one leg, it was last seen flying backwards over Bosnia. So if you've got any odd socks you know where to send them, or even the odd boot! Nationally the ANL were organising the Leeds Rock Against Racism (RAR) carnival. In the month leading up to the carnival Manchester ANL activists ran a full-time office and leafleted every school, college, gig, and football match they could cover. The return was phenomenal, with over ten double decker buses filled with carnival-goers from the Manchester area. At the same time a group of anti-fascists were charged with offences relating to militant anti-fascism in Rochdale, for which eight of them were eventually sent to prison. This also coincided with the SWP's move against squaddist elements in both London and Manchester, of whom they were politically embarrassed, prior to disbanding the ANL and pulling out of anti-fascist politics. The SWP expelled anti-fascists including some who were jailed for anti-fascist activities whilst members of the SWP/ ANL. Comrades indeed! The jailing of eight antifascists for militant action against fascism created problems for the families. The Rochdale Defendants Fund was set up to raise money. The campaign asked for support only from those who supported the actions of anti-fascists. Conditional support or support offered to only some of the 8 was refused. The SWP to their shame attempted to raise money for only two of the jailed anti-fascists. The campaign ran for 15 months during which contributions and donations came from many trade union groups, branches and shop steward committees. Gigs were held throughout the year, the one which proved to be most successful brought together Manchester's top three reggae bands and showcased Elliot Rashman (currently Simply Red's manager) as guest DJ. UB40 sent autographed LPs to be raffled. In 1985 AFA was formed by those committed to ideological and physical confrontation. This was soon put to the test when the NF attempted to hold a march and rally in Stockport in 1986. The SWP were strategically massed behind the police cordon outside the town hall, whilst the NF walked past waving banners. Two vans travelling in opposite directions pulled alongside the Nazis, whereupon anti-fascists emerged from the rear and engaged in meaningful dialogue with them. The Nazis and the police retreated to the shelter of the waiting room of Stockport British Rail station. A line of police moved on the anti-fascists who in turn moved towards them, whereupon the police and dogs turned and ran! Attempts to induce the Nazis to leave the waiting room with the assistance of smoke bombs proved unsuccessful. However, one Manchester NF-er complains of a little 'chestiness' to this day! Four fascists arrived late in a shiny new Saab (Daddy's? ), and on realising we weren't fascists they drove off at high speed. The car escaped but only to a set of red lights, whereupon anti-fascists turned the car upside down complete with occupants, and some kind soul threw in a smoke bomb for good measure! In another attempt Mr. Payne, BNP organiser, was contacted by 'an alleged sympathiser' who offered him information that the BNP required. Payne poured forth the BNP plan to storm the church and seize Viraj Mendis, drag him out and chain him to a lamp post, where the police could arrest and deport him. The exchanges were tape recorded and attempts were made to do follow up calls in the presence of the media. A further set of calls were made but Payne was nervous and non-committal. When challenged by the agent he admitted he'd been visited by the police, who had been made aware of the taped conversations by an 'anti-fascist journalist'!